The Free Music Store's Third Annual Rag-Revival Reunion on WBAI. WBAI's Dan Kavanaugh, Tony Elitcher, Eric Salzman and Barbara Oka give short speeches at the beginning of the program. Part 1 of the recording features Dan Paget playing Original rags by Scott Joplin, The ragtime nightingale by Joe Lamb, The cascades by Scott Joplin, and The American beauty rag by Joe Lamb. Willa Rouder plays The King Porter stomp by Jelly Roll Morton, The magnetic rag by Scott Joplin, Frog legs rag by James Scott, and Don't sell it, don't give it away by Buddy Woods. Mike Sahl and his father Harold Sahl perform some old standards, including Brother, can you spare a dime?, The desert song, Chloe, When a gypsy makes his violin cry, On the road to Mandalay, and The lost chord. 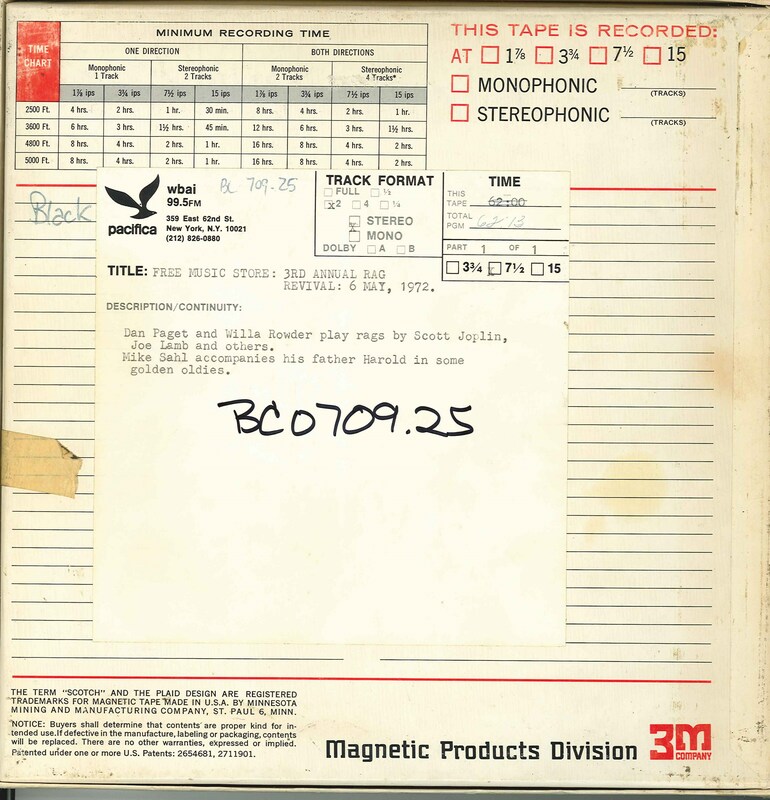 Produced and recorded in stereo on May 6, 1972 by WBAI's Music Department. This recording was formerly cataloged as BC0709.25A. 2 reels (ca. 70 min.) : 7 1/2 ips, mono.